DC Super Friends are very popular with my little boy, so with Bantam releasing a range of activity and first reader books I knew he’d be excited. With all his favourite characters such as Batman, Superman, Green Lantern and others, these books follow the super friends on adventures of fighting crime and saving the day! The first readers are aimed at 5-7 year olds, so 6 year old Miss M was keen to have read. She kindly read them to her younger brother and he eagerly viewed the pictures and enjoyed the story. These are perfect for her age to read with large text that is simple but interspersed with a few trickier words that she managed well. Crime Wave is about a baddie, Black Manta, who plans to steal the world’s largest pearl, but fortunately the DC Super Friends are there to stop him escaping with the pearl and catch the criminal in action. This is a typical super hero type of story, one that little ones love and that Mister B has listened to over and over. Hero Havoc follows Bizarro, a wannabe super hero who tries his hardest to have the same special powers as the others, but it always results in the opposite thing happening, therefore he never quite achieves what he sets out to do. He goes off to find Superman who is being held by Lex Luthor and it’s Bizarro that manages to set him free, finally making him happy and feeling worthy of being a hero. Both these DC Super Friends books have been enjoyed by my children, with Miss M reading them herself and Mister B listening to them. These are firm favourites that I can definitely recommend. The full colour picture pages help bring the stories to life with lots of recognisable characters that little ones will love! There are also a couple of activity books available, a wipe clean book which is great for practising pen control, something Mister B is just getting to grips with so this book has been great for him to write, draw, match etc. using his favourite super friends to guide him. The DC Super Friends sticker book has 4 pages of stickers to use on pages within the book as well as other activities such as mazes, counting activities, find the odd one out etc. The stickers proved a big hit with Mister B as I’m sure they will with any young super hero fan. We love the DC Super Friend’s range of books and like that they cover both fiction and activity books. We’ve really enjoyed them and found them a bit different to any other books we’ve had or seen. Why not check out these and more in the range from Bantam books? 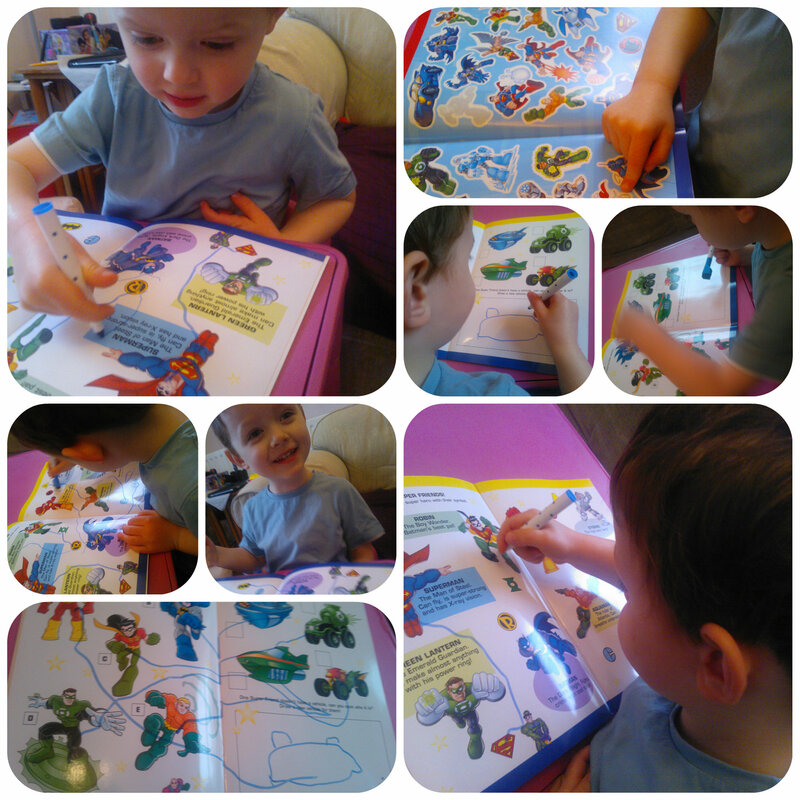 This entry was posted in Reviews and tagged activity books, batman, DC super friends, early reader, first reader, green lantern, stickers, superman, wipe clean by Fiona Martin. Bookmark the permalink. We’ve had these and the boys loved them. They’re really nicely done and Super Heroes are always popular! Jenny @ The Brick Castle recently posted…NOMAD ChargeKey and ChargeCard ~ The world’s smallest USB cables reviewed. These look fab! Great idea for any Superhero fan! My son has these books and loves them too! They are great books aren’t they. We’ve been very impressed. These look brilliant! I think my little man would love them!